This is not your ordinary theme. Stag is about the extraordinary. Stag is a theme for the modernist. Stag is for the creative. Stag, is for you! Stag is packed with the features you`ll ever need to build a professional, yet modern-looking website for your business. WPMLTM Compatible – Break the language barrier between your business and prospects by using Stag together with the WordPress multilingual plugin (WPML) to translate your website into multiple languages. Hundreds of Free Google Fonts – Customize the look of your website by choosing the best typefaces suitable for your needs from more than 600 Google Fonts, straight from the easy-to-use theme options panel. Premium Plugins Included for Free – SAVE $65 – Stag comes packed by default with premium WordPress plugins, like Revolution Slider, Visual Composerand Templatera. Plus, we created Delicious Addons, a plugin which extends Visual Composer with 20+ new elements, built exclusively for Stag. You get not only more value for the money paid for the theme, but also a truly great user experience! 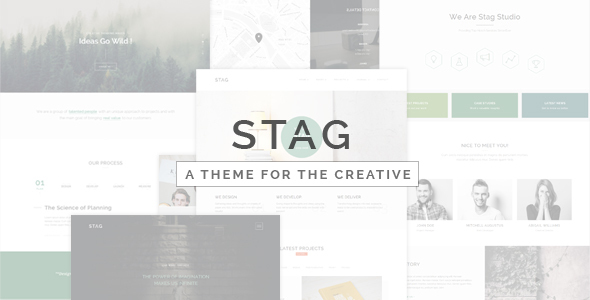 Multiple Blog Layouts & Post Formats – Stag extends the default WordPress blogging experience via blog layouts based on a minimal masonry look and a series of cool post formats: Standard, Gallery and Video. Versatile Header – Stag comes with multiple navigation styles(minimal, classic, fullscreen) and a header with a versatile behavior, which can be set for the entire website or for individual pages, helping you build even more landing pages for your prospects. Powerful Theme Options Panel – Stag versatility is powered by a solid, yet easy-to-use theme options panel, from where you can customize the theme`s feel and look without touching a single line of code. Extended WordPress Functionality – Stag extends WordPress by providing support for on-page sidebar positions, custom header taglines and styles, based on backgrounds powered by parallax effects. Beautiful Contact Forms – Stag is compatible with the very popular Contact Form 7 plugin. Build contact forms, project planners or subscribe forms with tens of custom fields that fit great with the theme`s overall design. Boxed / Wide Layouts – That`s right! 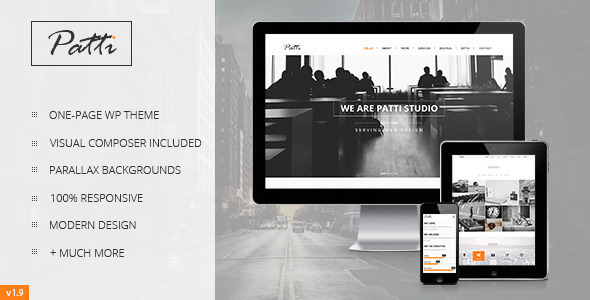 Ever wanted a modern website with the minimal look that you have in mind? Switch the page layout to boxed and you have it! It takes only 2 clicks. Socially Enhanced – STAG helps you connect with your social audience and increases your website`s visibility, via the sharing widgets built into the theme. Plus, the theme integrates with Twitter, Instagram, even Mailchimp plugins, to make sure that your visitors are becoming a part of your conversion funnels. On-Scroll CSS3 Animated Content – Bring to life the content of any page, with beautiful CSS3 animations and create an outstanding user experience, worth sharing. RTL Support – The theme is fully compatible with right to left( RTL ) languages like Arabic script or Hebrew, providing the layout switch that these languages need. Child Theme Included – Customize the theme, the right way! Install the child theme over the main theme and extend even more the already-powerful STAG theme. Read more about child themes at Wp Codex. Special thanks to Surya Cahya for his amazing work. New Feature "One click demo install"